There have been at least two artists who have operated under the name of Hefner in the UK in recent years. 1. Hefner were a British indie pop and "urban folk" band fronted by Darren Hayman. They were active from about 1996 until 2002; since then they have played together only once, for a tribute to the DJ John Peel, who was a strong supporter of theirs. Hefner began as a live band in 1995. In 1996 Darren Hayman recorded a tape for Sticky Records (named The Devotion Chamber) on which all instruments were played by Darren himself. 1. Hefner were a British indie pop and "urban folk" band fronted by Darren Hayman. They were active from about 1996 until 2002; since then they have played together only once, for a tribute to the DJ John Peel, who was a strong supporter of theirs. Hefner began as a live band in 1995. In 1996 Darren Hayman recorded a tape for Sticky Records (named The Devotion Chamber) on which all instruments were played by Darren himself. His friend from art school, Antony Harding, assisted, providing backing vocals. The band's first release was in April of 1997 when the 7" single "A Better Friend" was released by Boogle Wonderland. The single featured Antony on drums and John Morrison (from Rhatigan) on bass. Shortly after the release, the record label Too Pure offered a record deal to Darren, who extended the offer to Antony and John. After a few more singles, Hefner recorded their debut album Breaking God's Heart. A lo fidelity album primarily recorded in one take, Hayman has declared that this album is the one he is least interested in listening to, due to its unrealized potential. The Fidelity Wars would be their next record (with the recent addition of multi-instrumentalist Jack Hayter playing on some tracks, who would later join the band properly); a darker collection of songs. In the official website of the band Darren has explained that all of the songs gravitate around the concept of breaking up. Hefner had, at this point, recorded a large number of singles and EPs. Boxing Hefner collected some of those tracks that had not appeared on the previous albums, often as new recordings. The compilation also included some unreleased material. The band stated that this album was released primarily to mark Jack's actual joining. We Love The City marked a change in direction for the band. In contrast with previous records, which had older songs, all of the compositions on We Love the City were made for this record, which had better production value and more varied instrumentation. Dead Media, released in 2001, continued the interest that Hefner had shown in exploring new ways. Dead Media is certainly different from previous records in the sense of its electronic weight, an interest that led Darren to eventually create The French. After the band's final gig at the ICA in London on 10 December 2001 and the release of an EP called The Hefner Brain the following March, the band went on a seemingly permanent hiatus, save for one reformation for the "Keeping It Peel" tribute show, marking the death of one of their biggest supporters, Radio 1 DJ John Peel. 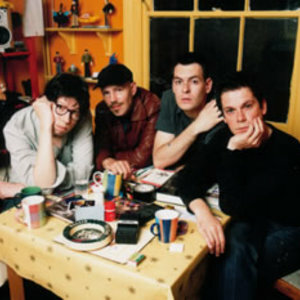 In 2005 a t-shirt was released that read "Hefner, Britain's Largest Small Band (1997-2002)", and in an interview Darren Hayman said "no, no reunion planned". In 2005, after a legal dispute between Darren Hayman and Too Pure, the rights to all the band's Too Pure recordings have reverted to Darren. As a result, he has released The Best of Hefner 1996-2002 (on Fortune & Glory) and Catfight (Cargo), a 2 CD collection of 43 unreleased songs, both in 2006. The full recording of Hefner's special live Peel Session performance from 23rd August 2000 in the eight piece We Love the City formation (amelia fletcher and a horn section - part of which appeared as a limited bonus disc with some copies of the CD of We Love the City) has been released under the title of Maida Vale in November 2006. All of the band's albums have also been reissued with bonus tracks. In 2008 Darren and Jack got together and played Hefner songs on a limited number of venues around Europe. This project is not planned to continue further after September 2008 though. Darren Hayman tours and releases music as a solo artist - sometimes as Darren Hayman and the Secondary Modern, but he has been involved in several solo projects: The French, The Stereo Morphonium and Hayman, Watkins, Trout And Lee. Jack Hayter releases solo stuff as well. 2. The other is Lee Jones who released an album called Residue, a number of 12"s and remixes on Inertia Records. Residue sold 85,000 albums independently through Inertia Records. Lee Jones, in response, took the project on the road around Europe, playing throughout Holland, Germany, Italy and France. Also appearing on national TV in both Germany and Holland. The album was voted number 3 in the BBC Radio 1 urban albums poll. Then all went quiet. He worked on Josee's solo album, Lost Souls Dancing, and moved to Berlin. At this time in order to satisfy demand Inertia released a compilation of his best remixes called "Reworks" featuring his versions of tunes by Lamb, 4 Hero, Omar faruk Takbilek and others and took time off to produce some other artists. In 2003 Inertia hooked Hefner up with Frazey Ford, lead singer of The Be Good Tanyas, a fantastic rootsy, folky band from Vancouver. The resulting material was magical but due to recording commitments to EMI the project had to be stalled until the Be Good Tanyas album was finally released. As of the end of 2006 the project has been revitalised with the partnership working together again. An album is due at the end of 2007.